We can all agree that sunflowers are beautiful, but I'd like to propose that they are also one of the most complicated and interesting flowers on this planet. We admire them for their height, their large inflorescence, their cheerful presence, their ability to move in a breeze and make the garden dance. But they also have attributes, both good and bad, that make them extremely fascinating. Let's go through them one by one and discuss. You may have witnessed young sunflowers following the sun with their heads (this is called heliotropism), but it wasn't until 2016 that scientists discovered the why and how of this process. They determined that sunflowers, like humans, have a circadian rhythm, a behavioral cycle tied to an internal clock. But the plant's 'turning' is actually different sides of the stem elongating at different times of day. This has to do with a plant hormone called 'auxin,' which does a lot of neat things, like assert apical dominance, but also elongates cells on different side of the stems at different times of day. We all know sunflowers are great for bees. Honeybees collect both pollen and nectar from the flowers, but native bees are actually more efficient pollinators of sunflowers. Here's why: Honeybees tend to forage either nectar or pollen on a single foraging trip, which means they visit different flowers on the sunflower inflorescence, neglecting others; native bees collect both nectar and pollen on foraging trips, ensuring cross-pollination. This is due to the kind of flower this plant makes, which I will discuss in the next point. But if you'd like to see more about this, you can check out this page from the Xerces Society. Sunflowers bear a type of inflorescence called a 'capitula,' which is actually composed of two different kind of flowers: Ray and disk. The inside of the sunflower is comprised of a lot of little tiny flowers called 'disk' flowers. Each has five tiny petals that are fused into a cup-like structure, 5 stamens (male parts), and a pistil (female parts). Each disk flower makes one seed. On the outside of the flower, the things that look like petals are called 'ray' flowers. They have all five petals fused to make one huge petal, and they also have five stamens and a pistil, and make one seed. This is a feature of all plants in the Asteraceae family, though each species can have vary in the amount of ray and disk flowers it has. Here's one of the not-so-great features of sunflowers. They are allelopathic, which means they exude chemicals that act as herbicides to the surrounding plants. All parts of the sunflower - seeds, hulls, leaves, flower petals, roots, root exudates - act this way, and can inhibit the growth of other species. Many plants do this - you might be familiar with the allelopathic qualities of walnut, for instance - and it ensures survival of their species, which is a good thing. But it's not a good thing for us gardeners, as we usually want to grow sunflowers mixed in with other, lower plants. Apparently grasses, potatoes, and beans are particularly susceptible, but I have noticed that even native wildflowers will not grow well around sunflowers. Usually I add sunflower seeds to my wildflower seed mixes and broadcast into the pollinator gardens. I never have good luck with this, because most of the sunflower seeds get eaten by birds or squirrels immediately. This is why I decided to germinate the seeds inside the greenhouse this year instead of directly in the garden. But I also have noticed that, in the areas where a sunflower does manage to germinate and grow, there is little growth around it. What I have discovered in my research that the allelopathic compounds in sunflowers especially affect the germination rates of other seeds. 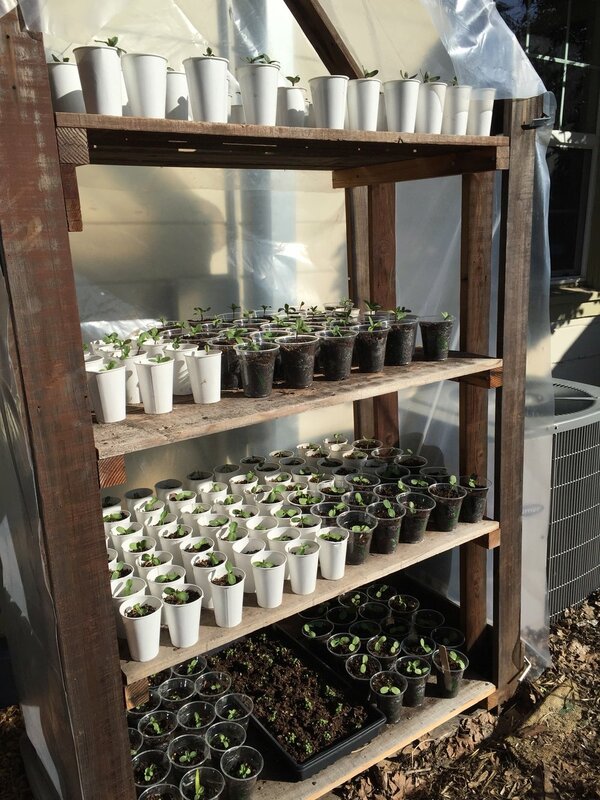 So, if the other seeds have already germinated in the pollinator gardens (and they have), and I've already got the sunflower growing well in cups in the greenhouse (I do), it might work to add these plants in and see how the other plants do around them. But, do I really want to take that chance? I'm just not sure. I might plant a couple in with other things just to see for myself what happens to more mature plants. But the bulk of these sunflowers are going to be planted in an area with no other plants around them, I think. What about you? 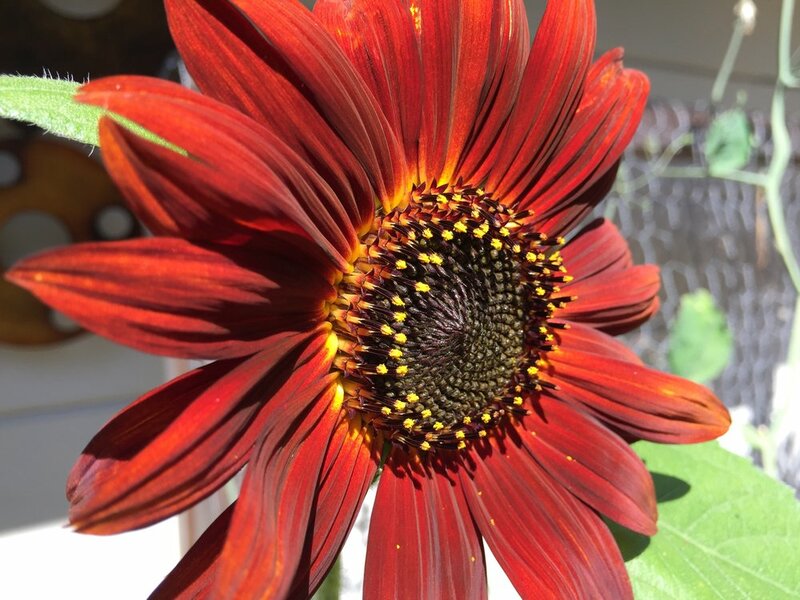 Do you grow sunflowers? Have you noticed this affect? Do you see lots of bees on your flowers? Have you seen sunflowers tracking the sun? Do you love these flowers as much as I do?